My kids love to collage so we decided to create two large collages to hang on the wall of our art area. I cut the two largest flaps off the top of a large cardboard box, put out some PVA glue and told the kids to go for it. They were in collage heaven! They glued bottle tops, shells, small pebbles, buttons, feathers, pie tins, cellophane, alfoil, beads, pom poms, patty pans, pipe cleaners and anything else they could find onto the two cardboard panels. The children continued to work on this over a few days, returning to the art table to stick on something interesting they had found. At the end of the week when it seemed we couldn't stick anything else on, we started adding paint. In the style of Jackson Pollock, the children drizzled, dripped, splatted and swirled thick paint onto the collage panels using teaspoons (an activity thoroughly enjoyed by all). 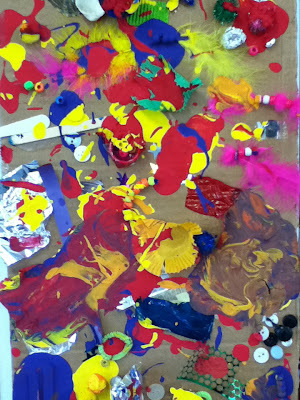 Inspired By Casa Maria's Creative Learning Zone - a treasure trove of art ideas for kids.